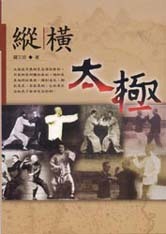 The Hong branch of Chen Tai Chi is a fluid, elegant and graceful style developed by Hong Jun Sheng, passed through Hong Guo to Yang Xi Shuo, the author of this book. The long 81 movement form is shown, along with many applications, most of which are throws. The book covers the long form, qigong and health, those generous applications, and principles according to physics. But that is not all. The enclosed DVD contains the full long form plus a 24 manner set; some excellent Chi exercises to train Tai Chi flavor; and a healthy representation of two-person applications—emphasizing Chin Na— along with a generous helping of Chen Push Hands practice. The final bonus: a definitely learnable Tai Chi short stick of at least medium complexity. Yang's movements are large and smooth, and the instruction is clear. We have other DVDs from the Hong branch of Chen Tai Chi but none with its short stick series. Simplified characters. This is a good book for the Tai Chi library for one main reason; it shows illustrations of the portly gentleman known as Fu Zhong Wen demonstrating the Yang set. Starting with Yang Chen Fu himself, Fu is considered by some to be one of the most perfect examples of Yang form even exceeding famous members of that very family. His physical resemblance to Yang Chen Fu might answer for some of this but his fidelity for detail is the product of much practice—a whole life’s worth—not just some superficial resemblance. For our Tai Chi enthusiasts, a good suggestion. For our Yang Tai Chi students, a must. 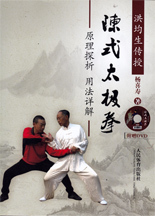 This is one of the first books written on WuDang style Tai Chi. The author knew some real luminaries, Li Jing Lin, Yang Ban Hou and Yang Chen Fu. 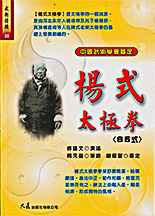 This books discusses the classics and principle of Tai Chi. The we are given the entire long set, based on the Yang Chen Fu model, shows a different, even longer variation of the solo set. The pictures and postures are instructive and nice examples of the quality of martial arts in the early part of the 20th century. The set is shown in 385 photos, just about the most broken down next to a video. There is a short section of Push Hands to close the book. A fine document showing the art at a crucial time in its development. Musings and essays by a long time student of the art. After a lifetime of studying with people such as Feng Zhi Qiang and Li Jing Wu this Muslim gentleman has compiled his writings on the whole subject of Nei Jia practice. Besides showing some internal cultivation methods he discusses many aspects of martial culture with a special concern for Wu De (martial virtue) and the truths of Nei Gong practice. Gu Ru Zhang is known worldwide as the master of the Northern Shaolin system. He is far lesser known for what some people consider his superior calling as a master of Cha style. And then he is even lesser known for his expertise in Tai Chi Chuan. A friend of Sun Lu Tang who taught him Tai Chi, his version that came through Sun of Yang style is an unusual combination of Yang style and Sun’s own characteristics. In this book, besides the form broken down, there are a number of introductory statements. One section focuses on the basic principles of Yin and Yang with some interesting illustrations. The last section in the book concentrates on Push Hands and, for its time, was one of the longer essays on this art. Really a key book for its time by someone who was not among the well known Tai Chi inner circle. This is a reprint of writings by Wang Jin Wu, author of "Tai Chi Explanations." The illustrations are very basic. The writings explore Tai Chi and its antecedents such as Li Dao Zi's Pre Heaven Boxing, Cheng Yun Di's 9 Small Heavens Boxing, Chang San Feng's 13 Postures, etc. He also deals with the Tai Chi Songs and other classical writings, the Tan Tian, Opening and Closing, there is then a breakdown of all major moves in the Yang set, then sections on Tai Chi foot and body work. A very early explication of Tai Chi's principles. This book, published in 1933, was written by a student of Liu Fang Shen. It is said to be WU style but the postures are longer, larger frame and more like typical Yang. The costume and the general movements of this early Tai Chi book are pretty well known among Tai Chi scholars. The book is nicely laid out and reproduced. The famous book of Yang demonstrating postures of the Long Fist. Nicely reproduced with clear printing this is a basic reference for the whole world of Yang Long Set. Also a section on Push Hands and some indication of applications. But, really, this books is famous as a clear photographic reference. This is a book on the legacy of Yang Ban Hou's Tai Chi. 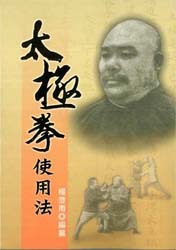 Wu Meng Xia studied Shaolin in his youth. Then Xing Yi, Ba Gua and Tai Chi. Among his teachers were Niu Lian Yuan ( a Yang Ban Hou student), Han Mu Xia and Gao Yi Sheng. These are said to be the secret transmissions from Yang Ban Hou. The book starts with very brief descriptions of each posture and how it is applied then continues to commentaries on the oral and written transmissions of Tai Chi. Example: "Cai Zai Shi Zhi." Plucking is in the ten fingers. Plucking (Cai) is to use form grabbing strength, it therefore uses the strength of the ten fingers using gripping power." It gives key phrases and condensed concepts. Also, we have a partial translation of this book available from Marcus Brinkman. The Published April, 1937 in Shanghai. This book discusses the Primal Chaos theory and distinguishing the principles of Tai Chi. Topics survey some unusual ideas such as Yueh Fei's and Jian Fa's contributions: Wang Tsung Yueh's writings, Wu Yu Hsiang writings, Li Yu Yi's own writings and more. The author is credited with doing initial historical work on Tai Chi that lead to the idea that the Yang Family Tai Chi we currently practice mixes Chen family Pao Chui with softened input from Jiang Fa. Text Only. This is a series of essays by a student of Shih Lin-Jiu. They indeed cover the length and breadth of the art talking about such things as: Tai Chi Classics; Push Hands; practice methods; Fa Jing; Internal Practice; Hard and Soft; Standing practice and more. Short, not too difficult traditional Chinese. No illustrations. Tai Chi Quan Lun Zi. This Tai Chi book starts with a complete, color presentation of over 130 postures performed by the author. The rest of the volume is entirely text. Essays and articles cover diverse topics: Tai Chi's origins, major ideas, spread, the Eight Methods, Reeling Silk, Yang Family TC, cavities, Tai Chi is "one family", correct practice, self defense, correct practice and many other considerations.